What a GREAT deal! 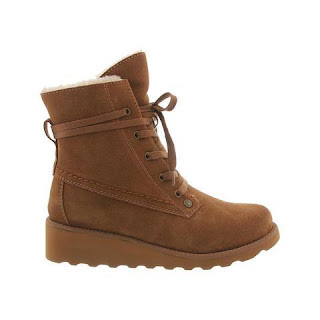 Right now get these Bearpaw Women's Krista Boots for $47.99 (Retail $89.99). Lace detail wraps around and ties in front of this 5.5 inch tall boot. Treated with our NeverWet technology and 1.5 inch tall Slim Tread Wedge blown rubber outsole for superior cushioning. I've had my Bearpaw Boots for over 10 years and LOVE them! Still look the same as the day I brought them home and worn daily in the colder months.